Unsurprisingly, Rwandan presidential incumbent Paul Kagame has won another term in office with 93% of the vote. Notwithstanding serious concerns about the fairness of the vote--some political opponents jailed, others exiled, others mysteriously killed--no one seems particularly eager to condemn the elections because of the moral credibility that Kagame earned by his military defeat of Rwanda's génocidaires in 1994 and the relative stability and prosperity that Rwanda has enjoyed since then (albeit aided substantially by the looting of the eastern Congo). Kagame's stated desire to make Rwanda a Singapore-like state, run competently and with a certain degree of openness by a technocratic elite careful to avoid favouring one ethnic group over another, isn't immediately a bad idea. Whether his regime can do so, creating a Rwandan nationality and identity, is another thing. Rwanda's troubles can be traced substantially to the fact that it's a country embedded in a complex of densely populated, deeply-rooted polities at once intimately united by trade and migration but separated by impermeable barriers of citizenship law and tradition. The African Great Lakes region, unlike many parts of sub-Saharan Africa before European colonization, supported a highly developed civilization, as Isichei observed. In much of the interlacustrine region, abundant rainfall and fertile soil supported a dense population, who produced a surplus which sustained courts and kings, and early European visitors wrote accounts of a land of plenty which attracted potential colonizers. It is easy to concentrate on the giants of the region--Buganda, Bonyoro, Rwanda, Burundi--to the neglect of their smaller neighbours, but there were over 200 polities in the region, some of them very small (45). These powerful states ended up succumbing to one colonial powers or another: Buganda and Bonyoro were absorbed into British Uganda, while Rwanda and Burundi became first German protectorates then Belgian protectorates after the First World War, the remaining lands to the west of the Great Lakes falling to the Congo Free State, the lands to the east passing east to British East Africa (Kenya) or the mandate of Tanganyika (now mainland Tanzania). Back in 2003, I reviewed Mahmood Mamdami's superb 2002 When Victims Become Killers, an analysis of the Rwandan genocide and subsequent Congo conflict that framed the genocide as the product of incompetent statecraft. The densely populated Rwandan kingdom was valuable to Belgians as a source of labour for the still-underpopulated Belgian Congo; heavy taxation and outright coercion drove a Rwandan diaspora to the neighbouring Congolese provinces of North Kivu and South Kivu, while other Rwandans migrated to the prosperous plantation areas of Uganda in the British sphere. By the time that Rwanda (and Uganda, and Congo) gained independence in the early 1960s, hundreds of thousands of people of Rwandan descent lived outside of Rwanda, soon joined by a quarter-million Tutsi refugees (expelled in the first of the post-independence convulsions). Both in Congo and in Uganda, Rwandans--even people of Rwandan descent born in Congo or Uganda--were not treated as citizens, with rights to own land, to exercise local self-government, or even to citizenship. People of Rwandan descent in the two countries were periodically persecuted and kept from attaining full rights. In Uganda, even after guerrillas of Rwandan descent played a crucial role in helping Yoweri Museveni overthrow the corrupt dictator Milton Obote in the mid-1980s, people of Rwandan descent were still denied citizenship. The only place that Uganda's Rwandans could exercise full rights, it seemed was Rwanda, and organized behind the Rwandan Patriotic Front largely Tutsi guerrillas began raiding across the border. Migrants from the African Great Lakes, meanwhile, were also terribly insecure in the Congo Free State, especially after independence with conflicts between natives and immigrants fueled by one faction or another in Mobutu's Zaire. Colonial promotion of migration also generated conflict over resource access. After the First World War, the Belgians brought Rwandan farmers into parts of Eastern DRC (such as Masisi) to provide the necessary labour for the newly created agricultural plantations and mining centres. When denied equal access to land after independence, they finally started purchasing land, but local chiefs continued to expect customary tribute. This explains the first major conflict: the ‘Guerre des Kinyarwanda’, which lasted for two years, was the first rebellion against chiefly abuse and the first step of a spiral of unending local violence. The independent Zairian state introduced a land law emphasising individual ownership in 1973, removing the legal status from land occupied under customary rule. This enabled those in political or economic power to appropriate any land not yet titled. The traditional authorities became the privileged intermediaries for the sale of land. Rewarded with ministerial posts and newly armed with Zairian citizenship, immigrants from Rwanda were able to concentrate a large number of former colonial estates in their hands. In Ituri Territory, similar developments could be observed. Here, it was members of the Hema who profited from their easy access to education and to employment opportunities within the local colonial administration, the mines and plantations (Huggins et al 2). As population growth grew and transnational ties intensified--the volumes of refugees fleeing Rwanda or Burundi were substantial, amounting to the hundreds of thousands, as early as the 1960s--toxic ethnic nationalism and exclusionary citizenship policies was preparing disaster. In the meantime, Rwanda was governed by a Hutu dictatorship. Colonial rule had managed to install in the minds of politically active Rwandan Hutus the belief that Tutsi were interlopers, a class of foreign exploiters no less despised than the Belgians, and so the various Hutu dictatorships which ran the country without significant interruption until the genocide treated the Tutsi remaining in Rwanda as a dangerous minority undeserving of equal rights with Hutu. For the most part, Rwandan Hutu benefitted from anti-Tutsi discrimination, receiving the land vacated by Tutsi refugees in the 1960s, enjoying one of central Africa's most prosperous economies, and generally feeling secure that the Tutsi would never come back and resume their colonial rule over Rwanda. The civil war that erupted in the early 1990s changed this unstable situation. Ugandans of Rwandan descent (largely Tutsi) were increasingly pushed by the Ugandan government into joining the guerrilla forces of the RPF, in the hopes of reclaiming their ancestral homeland and gaining a home. The Rwandan government, buffeted by a massive economic depression and increasingly unable to fight off RPF raids from Rwanda, turned to radical Hutu nationalism, trying to mobilize Rwanda's peasants with a Rwandan nationalism that excluded all Tutsi as potential traitors. (The Rwandan government also armed peasant communities, the better to fight off the RPF.) As the RPF raids became an actual invasion, the situation spiralled downward. Neither side was willing to honour the letter, never mind the spirit, of the 1992 Arusha peace accords which were supposed to end the war, mainly because neither the Rwandan government nor the RPF was willing to back down. After the failure of the Arusha accords, the RPF continued to attack the government, advancing slowly into the Rwandan heartland. Thus, the genocide, and the millions of Rwandan refugees fled the country after the genocide fearing RPF vengeance and/or justice, and the war waged by Rwanda and Uganda against the génocidaires then Mobutu then against the Kabila government the two countries their installed then between Rwanda and Uganda via their proxies, with all the millions of dead produced. Is there a way out? Conceivably, the East African Community to which Kenya, Tanzania, Uganda, Rwanda, and Burundi all belong, could break down the barriers of law that have proven so harmful. Even without a common citizenship or political federation, if these five East African states--including the core of the African Great Lakes culture zone, it's worth noting--did establish a single market for labour, et cetera, on the European model, citizenship laws couldn't be used as such bludgeons against unpopular ethnic minorities or migrant communities. The region is ethnically diverse, and different ethnic groups have frequently come into conflict (Kenya's recent crisis comes to mind), but there are underlying commonalities. 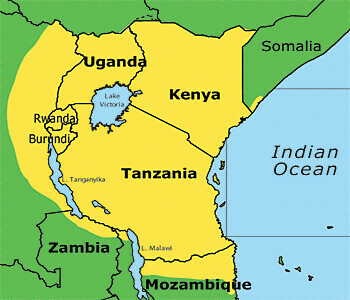 For instance, the East African Community's territories map closely onto the zones where the Swahili language is spoken, whether as a first or a second language. Is the above that dissimilar from the maps which show the core of the European Union as lying in the lands united by Charlemagne's empire? Then again, the early signs are that, East African rhetoric notwithstanding, citizenship and migration in the African Great Lakes remains fraught. Hovil et al observe in their paper "A Dangerous Impasse: Rwandan Refugees in Uganda" that the Rwandan refugees remaining in Uganda fear the current government, with many refugees arriving since 2001 in response to the RPF's closing down of public discourse, while the plight of the Burundians in Tanzania remains as severe as ever, to say nothing of the suppressed ethnic conflict in Rwanda and Burundi, and the bouts of massive ethnic violence that occurred recently in Kenya. We'll see.